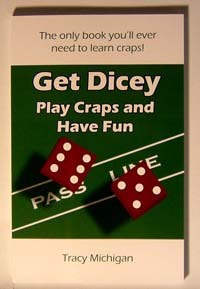 If you’d like to play craps, then Get Dicey: Play Craps and Have Fun will tell you everything you need to know. Written by a Las Vegas craps dealer, Get Dicey reveals everything about craps in a fun-to-read book that quickly explains how to play this popular casino game. Whether you have already played craps or want to play craps for the first time, it’s hard to learn how to play when you’re on a live game. Craps is fast-paced, which leaves little time for casino staff or even your buddies to tell you what is going on. The author of Get Dicey wrote this book for all players. As a craps dealer, the author introduced countless people to the game, but a busy casino is no place to try and explain how to play craps. Now, in Get Dicey, everything about craps can be revealed. It’s all true. Going to a casino is about having fun. Of course winning is the most fun, but you also want to fit into the exciting atmosphere. The game of craps is steeped in tradition and there are points of etiquette to observe as a matter of politeness to other players. Also, because craps is such a hands-on game for the players, there are rules the casino will enforce. It’s best to know them. In fact, the craps scene is so interesting, the chapter from Get Dicey about game etiquette and protocol was featured in Midwest Gaming & Travel magazine. After reading Get Dicey, you’ll be armed with the knowledge of the best bets on the craps table. Then you’ll be in a position to win the most money possible if your game gets hot. Players who don’t know how to play frequently miss out on hundreds, even thousands of dollars in winnings. They don’t bet their odds or they’re wasting money on the wrong bets. With the powerful craps betting strategies laid out in Get Dicey, you’ll be able to take your game (and your winnings) to the next level. After you read Get Dicey, you’ll never make a rookie mistake again. Before you join your family or friends on that next trip to the casino, make sure you’re ready to win and look cool doing it. Read Get Dicey. It has everything in it your dealer wants to tell you but doesn’t have time…or can’t tell you. Join the players of this popular game by getting your copy of Get Dicey: Play Craps and Have Fun.